All it took was a trip to Rochester, three overtimes and an otherworldly performance by goaltender Charlie Lindgren for Lakeville North to beat intracity rival Lakeville South 2-1 on Friday, March 4, for the Section 1AA championship and a berth in the Class 2A state tournament. Oh, and don't forget about junior Blake Winiecki's wraparound goal 25 seconds into the third overtime that ended the marathon matchup. "I came down the left side and there was nothing there, so I wrapped around and somehow it squeaked through, and to be honest I have no idea how,” Winiecki said. “But I'll take whatever kind of goal it is in triple overtime." Winiecki also scored at 13:53 of the first period, a power-play goal on an assist from Erik Ratt. For the second straight year the No. 2-seeded Panthers (13-14-1) lost both regular season matchups to the top-seeded Cougars (16-9-2), only to beat them when it counted in the sectional title game at the Rochester Recreation Center. While goals were hard to come by, controversy was abundant. Both teams had the apparent goals waived off by the referees. A shot by Lakeville South’s Evan Peterson in the second overtime appeared to have circled the back of the net and then popped out, but the referee immediately signaled no goal. There was a stoppage in play for a good 5 minutes to sort it all out. Lakeville North’s Brady Frahm and Lindgren turned in stellar performances. Frahm, a senior, stopped 33 shots on goal he faced, while Lindgren, a junior, had 51 saves. "It was a game where everything went my way and it was probably the most fun game I've ever played in," Lindgren said. With Lindgren as the last line of defense, the Panthers contained Lakeville South’s high-scoring duo of Justin Kloos and Alex Harvey, who entered the matchup with 11 and 10 points, respectively, in their previous two sectional games. Lakeville North ran into penalty problems in the second period, when it mustered one shot on goal. Lakeville South's lone goal was scored by senior Drew Brevig 9:25 into the second period, with Harvey collecting an assist. Lakeville North will be making its second consecutive trip and third in the past six years to the Xcel Energy Center in St. Paul for the state Class 2A tournament. 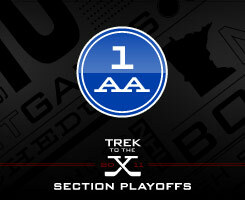 Quarterfinal play begins Thursday, March 10. Last year the Panthers lost to Minnetonka 6-1 in the quarterfinals and fell to Duluth East 4-2 in the consolation round. This season they're looking to use another year of experience to get past their first-round foe. "We've been there the past few years, and I want everyone to enjoy the experience, but it's also time to move to the next step and win a game," Lakeville North coach Randy Schmitz said.